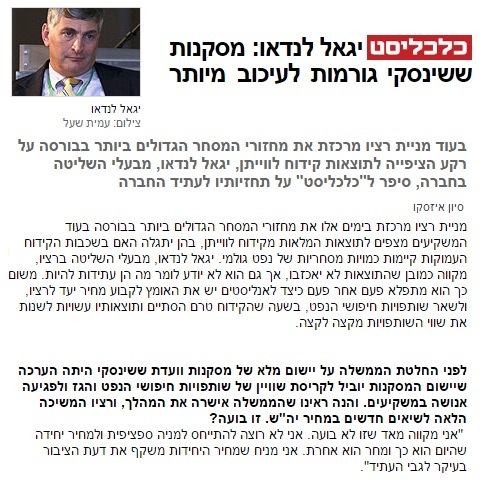 In the interview, Yigal Landau claimed that the committee conclusions have been detrimental for all oil and gas exploration partnerships. He said the conclusions have led to an unnecessary delay, which is proving very costly for the State of Israel. In addition, he criticized the government for failing to fulfill the agreements it had signed. This entry was posted in In the Media, Oil and Gas Exploration and tagged Bank of Israel, Leviathan, Ratio, Ratio Limited Partnership, Sheshinski Committee, Yigal Landau. Bookmark the permalink.